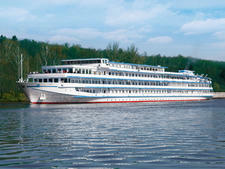 S.S. Bon Voyage originally began life in 2006 as Uniworld's River Royale. 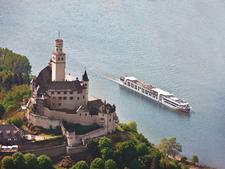 It was refitted substantially in 2013 and was, for a time, one of the most expensive river cruise ships ever built. 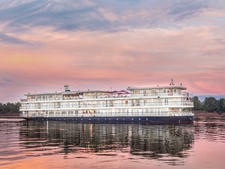 But times change, and Uniworld sought to make River Royale more relevant than ever. 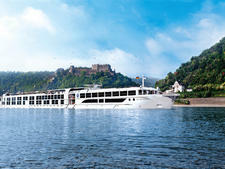 Rather than simply refitting the ship again, Uniworld completely transformed it into one of its newest Super Ships: S.S. Bon Voyage. 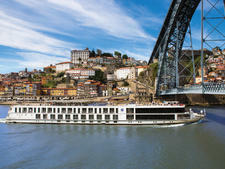 Debuting just in time for the start of the 2019 river cruise season, S.S. Bon Voyage debuts with an entirely new look and feel that pays homage to its itineraries in Bordeaux, France, and adds new features, too. 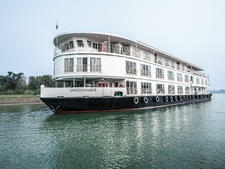 Decked out with totally revitalized suites and public areas, S.S. Bon Voyage will also sport a new top-deck swimming pool and lounge area, as well as four brand-new suites. 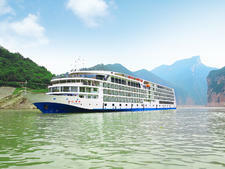 Expect Uniworld to tease out additional information in advance of the ship's launch. Most meals are served aboard S.S. Bon Voyage in the ship's main dining room, Le Grand Fromage. As part of the refit, this area now features Le Cave du Vin -- a private dining and cooking demonstration experience where Uniworld's talented chefs prepare an exquisite seven-course meal for a small group of patrons. 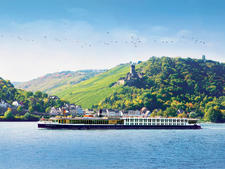 Passengers can reserve a space at Le Cave du Vin onboard by speaking with the ship's concierge. A new bistro inspired by Bouillon Pigalle in Paris is also featured onboard. 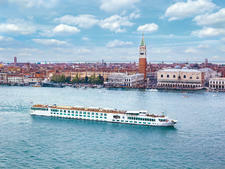 Casual fare is served in the ship's main lounge and forward-facing, open-air La Brasserie. Up on the sun deck, casual fare is available poolside from an adjacent new dining venue known as Le Cafe du Soleil. A 24-hour coffee and tea station is also featured in Le Salon Champagne main lounge at the forward end of Bordeaux Deck. Uniworld is known for its cuisine; it is not unreasonable to expect the best of the best at every turn. 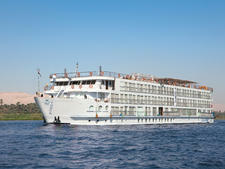 All cabins and suites will receive new furnishings and a brand-new decor scheme as part of the ship's transformation. 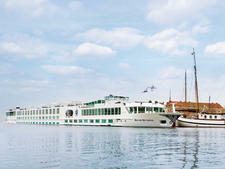 Spread across three passenger decks, these range from tastefully decorated "Classic" river-view cabins featuring fixed windows to Deluxe and French Balcony cabins that offer more space and larger windows. 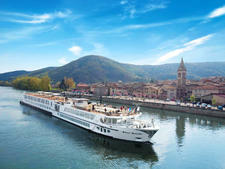 Four new suites grace the uppermost Bordeaux Deck, with two designated as Grand Suites amidships and two forward Suites. Cabins and suites will have exquisite marble bathrooms throughout, complemented with top-of-the-line furnishings and unique decor. 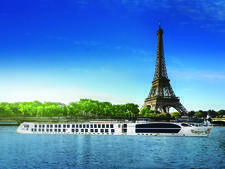 On S.S. Bon Voyage's uppermost deck, the Soleil Deck, cruisers will find plenty of space to relax and enjoy the views of France as they slowly drift past. In addition to shaded and exposed loungers and chairs, the Soleil Deck is also home to a new swimming pool and adjacent cafe offering lite bites. A small jogging track encircles the deck, though real fitness aficionados will find it more productive to simply go for a run in town when the ship is docked. 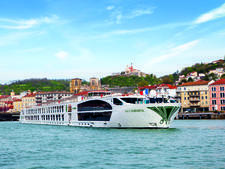 Onboard entertainment consists primarily of live music on most evenings in the Le Salon Champagne, or from performances by local guest entertainers brought onboard in select ports. Typically, most passengers will converse over cocktails during the pre- and post-dinner hours and then retire early to their cabins after a long day of exploration ashore. 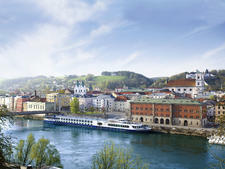 Uniworld offers special family-friendly river cruise departures as part of the company's "Generations Collection" of voyages. 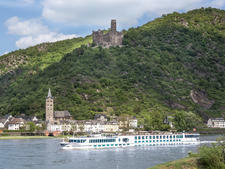 Apart from that, the S.S. Bon Voyage is not well suited to families with children under the age of 18, as there are no dedicated areas designed for kids and no special provisions made onboard outside of these Generations Collection cruises. 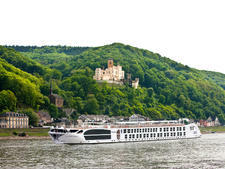 S.S. Bon Voyage will feature on three itineraries for Uniworld in France: the 15-day Portrait of Majestic France from Paris to Bordeaux, the eight-day Brilliant Bordeaux sailing round trip from Bordeaux and the 22-day Ultimate France that travels from Bordeaux to Avignon.